Nephren-Ka, the Dark Pharaoh, is one of the two new Ancient Ones included in this expansion, the other being Abhoth, the source of uncleanliness. Both have distinctive elements–when facing Nephren-Ka, investigators must unravel the secrets of the pharaoh’s rule, much of which has been stricken out of history, while also contending with the possible threat of one or more of the many Masks of Nyarlathotep. Abhoth, meanwhile, has what is perhaps the most unique Cultists to date for Eldritch Horror. They aren’t really cultists at all, but rather the Spawn of Abhoth, so when investigators meet a Cultist monster during an Abhoth game they have a card encounter against one of the Spawn in place of a standard combat encounter. This can be especially interesting and challenging, as unlike a traditional Cultist the investigators may have to resort to different skill rolls to overcome the encounter, which comes in the form of a complex (pass/fail effect) encounter. This expansion also brings with it some fun new investigators like the perpetually-Cursed Rex Murphy (who gets some pretty solid benefits to offset the fact that he’s always Cursed) and Monteray Jack, who is geared towards acquiring ancient treasures and using them to push back the danger of the Ancient One. As always with Eldritch Horror expansions, there are also new cards for the various desks, including a selection of Glamour spells that provide some sort of standing effect but require a Lore roll during Reckonings to control the magic. Overall, I really liked this expansion. It introduces some great new elements and characters to the Eldritch Horror game, and also expands on the existing decks and game play. It also seems to indicate that the game designers are learning as they go, building on what they did with Mountains of Madness and finding ways to keep the game evolving and changing. 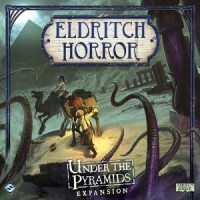 Add a Review for "Eldritch Horror: Under the Pyramids"